Parties are a total of 1.5 hours. Your party will have access to all of our state-of-the-art gymnastics facility. 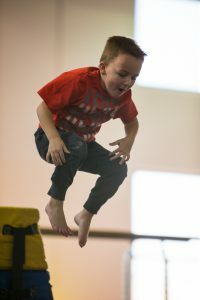 Games and fun include the in-ground trampoline, loose foam pit, obstacle courses, and more! Certified instructors will lead and supervise the party children and help you with anything you need. Age appropriate games and activities can be planned, if birthday girl/boy would like. The party area is available for eating and opening presents. It has a table that sits approximately 15 kids, plus additional chairs for adults. Gymcats will supply paper products. You are just responsible for the cake and any other food items you want to bring. All party guests will receive a free lesson card. Parties are $195 for up to 15 guests for 1.5 hours. To secure your spot you will need to provide a $50 deposit. Each additional guest is $10 – with a limit of 30 total guests. An additional half hour may be added to the party for a flat rate of $60. *Call (801) 331-8643 ​ or email us at utahgymcats@gmail.com and we will contact you to reserve your party. No participants will be allowed on the equipment without a waiver signed by a parent or legal guardian signature. Sorry, but we also cannot allow anyone over the age of 23 on the equipment at anytime. Feel free to download the waiver here and include it in your own invitations or use one of the Gymcats Invitations below which includes a waiver and map for your convenience. We have two different invitations you can download and print off. They include a map and the waiver to further simplify what you need to do to plan your party. IF YOU WOULD LIKE AN EDITABLE COPY OF AN INVITATION AND HAVE ACCESS TO MICROSOFT PUBLISHER, PLEASE EMAIL US AND WE WOULD BE HAPPY TO SEND IT TO YOU.